Learn the digital strategies you need now to connect with more contractors in a fragmented market. Construction spending has been on the rise, a welcome trend for contractors of all sizes and specialties. And for those that supply them. But there’s a catch: no two contractors are alike. From trade shows and giveaways to lunch-and-learns and demos, the sales possibilities are endless. But they can’t be trusted to work all of the time. There is, however, one constant few are harnessing to potential. Informed digital marketing strategies let brands connect with disparate audiences on their terms. To host web pages, employ search engines, shift seamlessly into mobile, and connect via social with content that matters. Separately, these components are impactful enough. Integrated with strategies, they’re powerhouse plans. If these efforts sound complex, we’ll illuminate the path. 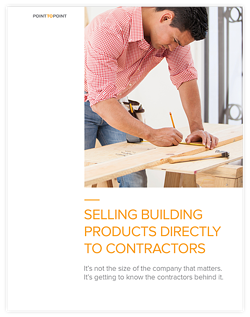 Begin by discovering the nuances of this fragmented market through our informative whitepaper, “Selling Building Products Directory to Contractors.” Then get inspired with marketing ideas to bring in the leads. Fill out the form to the right to receive our whitepaper, and let us show you how digital strategies have the power to transform building products sales. Complete the form to get the report now.